for a black and white film. Damn you and your beautiful but misleading posters, Filmindia! But even in color, this film would have been dull (just a little less so). Besides for Zippy and some occasional hilarity, the characters were boring and preachy—or cartoonishly villainous—and the story boring and predictable. Dilip was Tragic as always, but Dev somehow managed to not be his usual debonair self. Maybe Bina Rai didn’t inspire him, although I think she’s lovely. 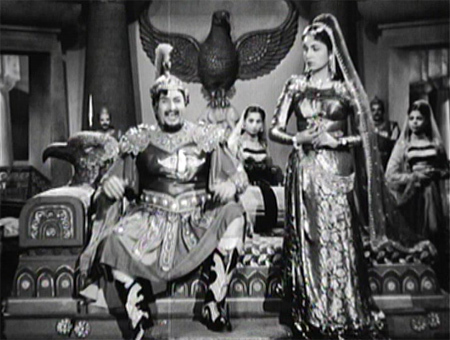 Dev plays Bhanu, a commander in bad King Zhingoora’s army, who pillages and loots with glee until a village girl named Durga (Bina Rai) slaps him one day. I crack up at the sight of him: I guess an ill-fitting cardboard helmet and a silly mouche will kill the debonair in anybody. Durga gives Bhanu a furious lecture about his bad deeds, and he sheepishly takes his army back to King Zhingoora. Zhingoora himself (Jayant) is pretty funny—he dresses in a Roman soldier outfit and what look like cowboy boots, and refers to himself loudly in the third person. I am sure that nobody familiar with Agha’s oeuvre will have trouble understanding that he and Zippy share wonderful chemistry. They give every appearance throughout the entire film of having a great time together, and it is fun to watch. Unfortunately it’s just about the only fun, but still. At this point Bhanu arrives and renouces violence and oppression (very boring dialogue), much to Zhingoora’s displeasure. He is given a week to change his mind, after which Zhingoora will teach Bhanu and all the villagers a lesson if they haven’t come around. Bhanu returns to the village to help the villagers defend themselves against the eventual onslaught of Zhingoora’s soldiers. 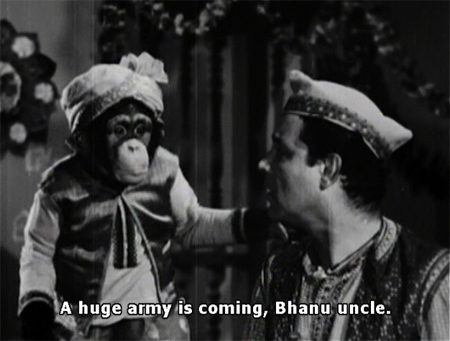 He first meets a very suspicious Durga and her childhood friend Mangal (Dilip Kumar), who looks just like William Devane! Mangal is madly in love with Durga, but he’s too shy to tell her so. Bhanu wins them over when he saves Durga from a charging bull and is injured in the process. They manage to convince the other villagers that Bhanu is genuinely there to help, and he’s welcomed as a brother by Mangal—who is unaware of Durga’s growing feelings for Bhanu. Back at the palace, Bhola and Zippy are freed by Bhola’s beloved, Chameli (Mohana). They make their way to the village, where Bhanu and Mangal are readying the villagers for warfare with a thrilling and patriotic anthem. 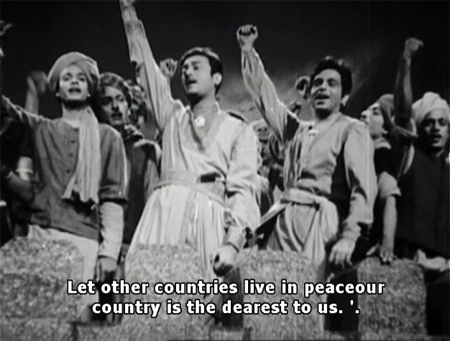 I know this is just a film of its time—only eight years post-Partition—but it’s really annoyingly earnest at times. When the villagers aren’t training (i.e. doing jumping-jacks—and yay! the women get to join in too! ), Bhanu and Durga romance each other happily, unbeknownst to Mangal. 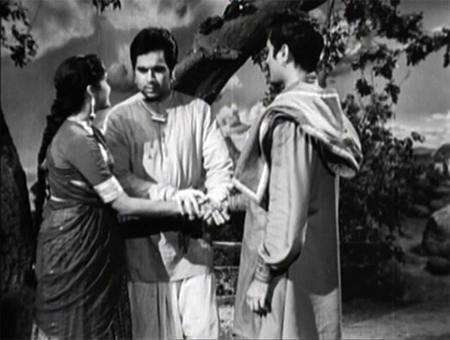 Mangal’s mother (Shobhana Samarth—who in real life is seven years older than Dilip) goes to Durga’s father with a marriage proposal for their offspring, which he accepts with the caveat that Durga must approve it too. Certain that Durga will approve, Ma goes home to give the good news to Mangal. He gets one song’s worth of happy time before discovering that Durga loves Bhanu. Poor Dilip! It’s nice to see him all joy-joy, even just for four minutes. When Durga’s father tells her about her impending nuptials, she breaks down and tells him the truth. He promises her that she can marry Bhanu if she wishes, and she runs off to give Bhanu the good news. Another villager sees them together, and tells Mangal. After initial anger on Mangal’s part, tears from Durga, and noble self-sacrifice from Bhanu, Mangal gives Bhanu and Durga his blessings. So sweet, except I can’t help but feel a *teeny* twinge of annoyance that Durga’s happiness is completely in the power of the men in her life. Ah well. Dilip now gets some good screen time to himself and uses it fully: he emotes mournfully, sings a sad song, and nobly tells his mother than Durga was right to choose Bhanu. All’s well that ends well, except that the film isn’t even close to over yet. The wedding is interrupted by a little boy bearing some news. Zhingoora has decided to attack. Can the villagers—led by Bhanu—keep Zhingoora and his army out? If they do, will Zhingoora give up gracefully? Will Bhanu and Durga manage to get married? Will Mangal be required to sacrifice, sacrifice, and sacrifice some more? Well, yes, but it takes forever and gets quite boring and repetitive. Even Zippy can’t save the second long drawn-out half of this one. Dev and Dilip sleepwalk through most of this. Dilip looks great all unshaven and brooding, although he also looks a little the worse for wear. I think this was the year that he also did Devdas, and then went to get psychiatric help for the depression all his depressing roles had visited upon him. Bina Rai is pretty and sweet, but not much else. Even the songs (C Ramchandra) are just okay—pretty but not anything special. As I said earlier, Agha and Zippy really have the best time, and are the most entertaining (although I could happily have lived without the Bhola-Chameli CSP). Zippy has a very intelligent quality about him (which makes it often seem like he is humoring the less-evolved Agha), and you can’t help but sit up and watch when he’s on screen. Zippy is a loyal lover. On arrival at the Santa Cruz airport he kissed Mohana and stuck to her till he departed. That proves that Zippy believes in cushioned comforts. So do many but they are not as fortunate as Zippy. Meet Zippy and Mohana in “Insaniyat”, the greatest box-office hit of the year produced and directed by S.S. Vasan for Gemini. Posted on August 24, 2009 at 4:52 pm in Baburao Patel's Poisonous Pen, Hindi movies	| RSS feed You can skip to the end and leave a reply. “n ill-fitting cardboard helmet and a silly mouche will kill the debonair in anybody” – To kill the debonair in Dev, you just have to kill his PUFF! I’ve seen this DVD sitting in my local video shop and have been tempted to buy it often (especially after seeing your Filmindia scans) simply because its Dev-Dilip together and because I’ve never seen Dev in a costume drama. Thankfully, though, I’ve resisted the temptation and from your review it appears to have been all to the good. This kind of thing calls out for your comic-strip treatment – Dev is certainly a scream in his fancy-dress. And lol at “cushioned comfort”! Trust Baburao to get to the heart of the matter! I have this movie sitting at home. I expected it to be seriously good, but ah well. I’ll watch it eventually now that I know what to expect. Also forgot to add, this is probably the time only time, we see a delightful, swashbuckling, carefree, Dilip Kumar- another reason, I savoured the length. Yeah, I don’t think you need to bother. It’s dull dull dull (except for Zippy). Ohhhh I think this film was once touted as great because it starred Dilip and Dev together. What a hash ! But I like the screen caps. So maybe the film can be re-released as a pictoral book. Apparently Dev Anand wasn’t very happy with his experience working with Dilip in this film. He called Dilip a surprisingly “selfish* actor – a charge several other co-stars have levied against the Tragedy King. I would currently probably watch a movie which involves Dilip watching paint dry, so this sounds okay to me. I hope I don’t have to buy from Eros directly. Does it have the suicidal tomatoes at the beginning? I’m with you memsaab regarding these alluring, colourful posters which tempted me into buying the vcd. I bought it for both Dev Anand and Dilip Kumar. Dev Anand doesn’t impress, but Dilip looks great, so fans of DK won’t be disappointed. I read that Dev Anand had his own ego problems when with other actors, and was very self centred. The King was funny it’s true. There wasn’t enough of him though—he disappeared for a long time in the middle. But he was very OTT when he was there! I tried watching this movie some four years ago on some channel on indian tv! left it after some 15 minutes! Baburao is obsessed with boobies and won’t deny! Esp. well-upholstered cushiony ones (he loves his furniture metaphors too). Both the actors, after swearing they would never act in a Madras film, took the offer because the Madras producers paid well and on time. 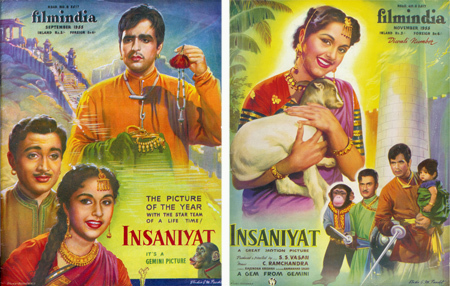 Dilip Kumar was contemptous of Madras films calling them “hunterwali” films. 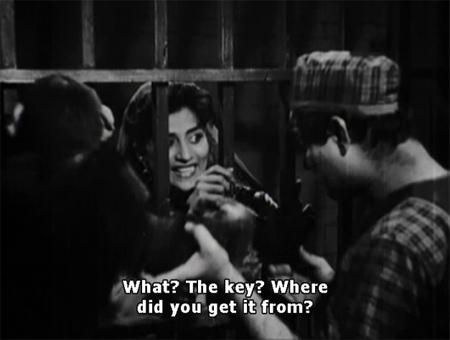 Remember, this was the time of the socially conscious cinema of Bombay. 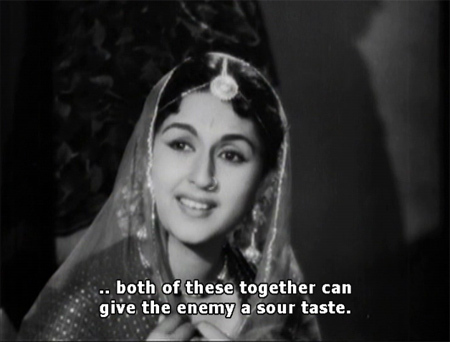 But the money was so good that they both agreed; Raj Kapoor followed soon after (Sharada). While Dilip Kumar continued to act in Madras films, Dev Anand swore he would never and did only one more, Amardeep. 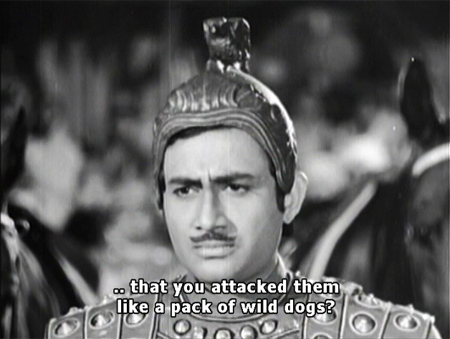 He was too much of an urban star to do a costume drama involving ‘Indian’ outfits. Well, there were a lot of issues on set and the film was unfortunately not a good product. I do know Dev Anand did not enjoy the experience, but Dilip Kumar did not really have a problem and proceeded to do many more films. 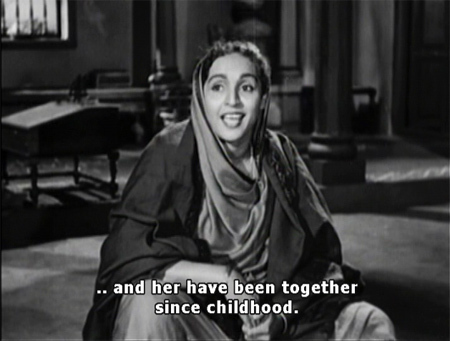 One thing to mention though was this was during the height of the Dilip Kumar-Madhubala affair and Mb was also doing another Gemini film Bahut Din Huye at the time. During the shoot she collapsed due to her illness and convalesced for a few months in SS Vasan’s home. Close friends of the family, they (Dilip Kumar-Madhubala) were able to patch up differences at the time in Madras and as a special favor, the elusive Madhubala appeared in public on Dilip Kumar’s arm for the first and last time at he premiere of Insaaniyat. 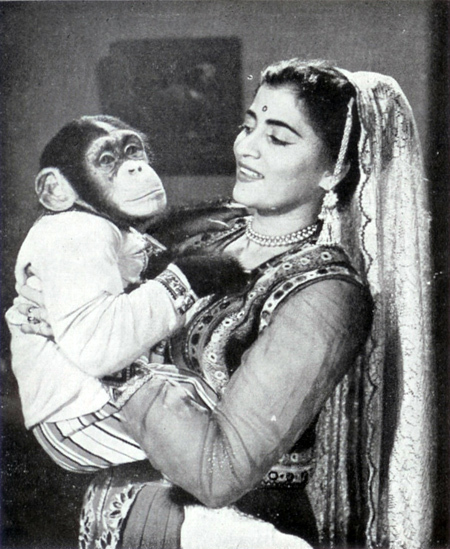 However Dilip Kumar was under extreme stress due to Madhubala’s illness and various other ongoing issues at the time. 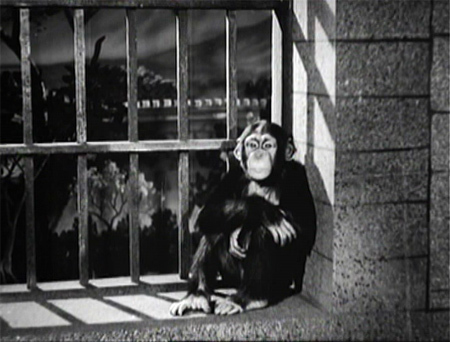 The chimpanzee Zippy was the most expensive performer in the film and was flown in from Hollywood and paid $100,000 at the time. He was brought with his trainer and kept in Gemini Studios in Chennai for the few months the film was being shot. The original director of the film was someone else and due to differences with my great grandfather SS Vasan and a lacklustre product, he took over when 70-80% of the film was complete as director and completed it/polished it up. There was no tamil version of this film and it was one of the biggest debacles from the Gemini stable in Hindi following successes such as Mr Sampath, Chandralekha, Nishaan and others. It went on to prove that just a formula of stars, attractions, big sets, naach-gaana and a costume drama is not necessarily going to make the best films. The film did collect decently well at the box office esp with its cast and the famous Gemini publicity – but it was not a patch on other good films from the studio before or after. made an typo. 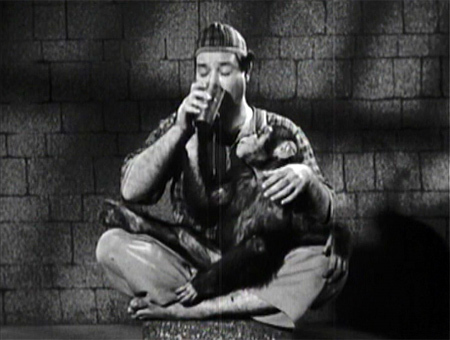 The chimp Zippy was paid $35,000 and not $100k as it says in my post. Abhi na jao choor kar, ke dil abhi bhara nahi. But time spares no man. 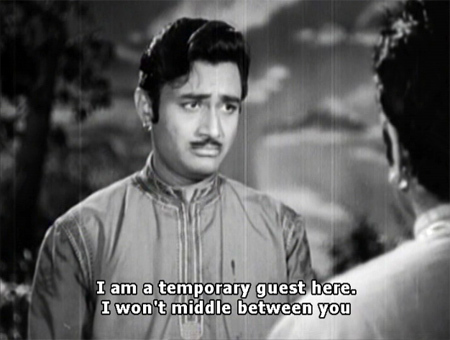 Even if you are the evergreen, seemingly invincible Dev Anand. His death is not to be mourned. but a life to be celebrated. A man full of zest even at an over-ripe age of 88, and wanting to do much more. And he left us, like a good soldier, with his boots on, working on yet another film. 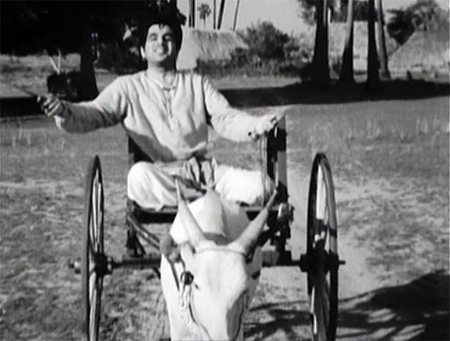 For him life was sirf film, film aur film, though many considered him to be egoistic, being sirf mein, mein, aur mein. Whatever be the case, there is no denying that he was sui generis, bringing in so much style and glamour to the Hindi cinema, quite an antidote to the Chaplinesque Raj Kapoor and the tragedy-stuck Dilip Kumar. The trio ruled the hearts of the millions of movie fans for decades and generations. But the following Dev Anand had, varied from 10 to 90. He was the longest lasting hero who was as handsome as anybody could be at 50 and as zestful at 88 as humanly possible. He still wanted to achieve so much in life, that for him and us, has cruelly been stopped mid-stream, and not at the fag-end. He will remain an inspiration for millions of people, not only in film line but in any sphere of life for his sheer zest for life and never-say-die spirit. Mohammad Rafi, Talal Mehmood, Manna Dey, Hemant Kumar. The film sparks curiosity because it is the only film dilp & dev acted together. Dilip as usual, wanted to hog the limelight & this did not go well with dev. The film deserved to flop – it was lousy.